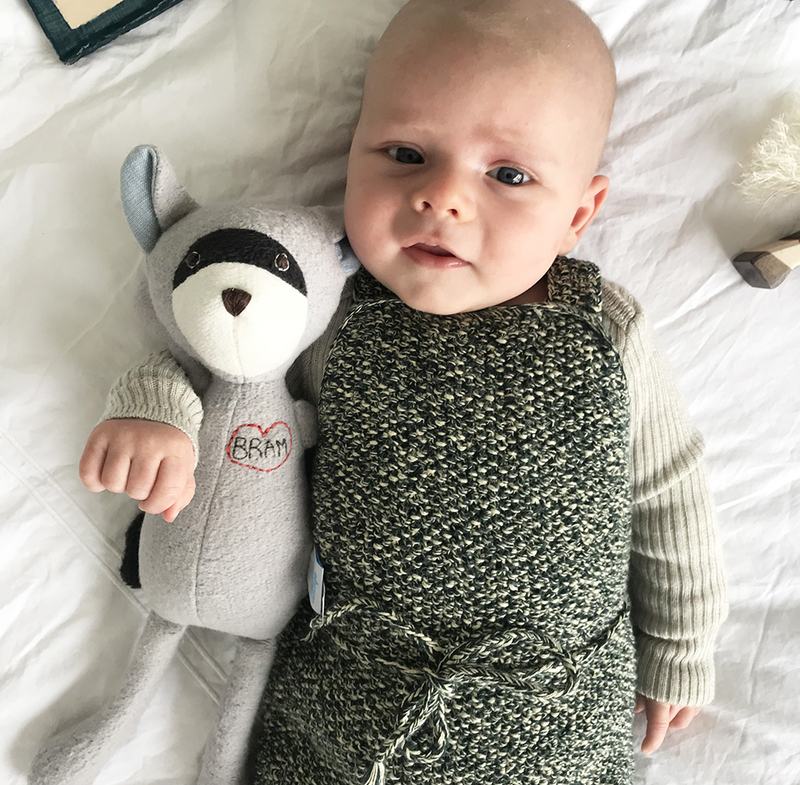 Personalised baby gifts — such a sweet idea for newborns! 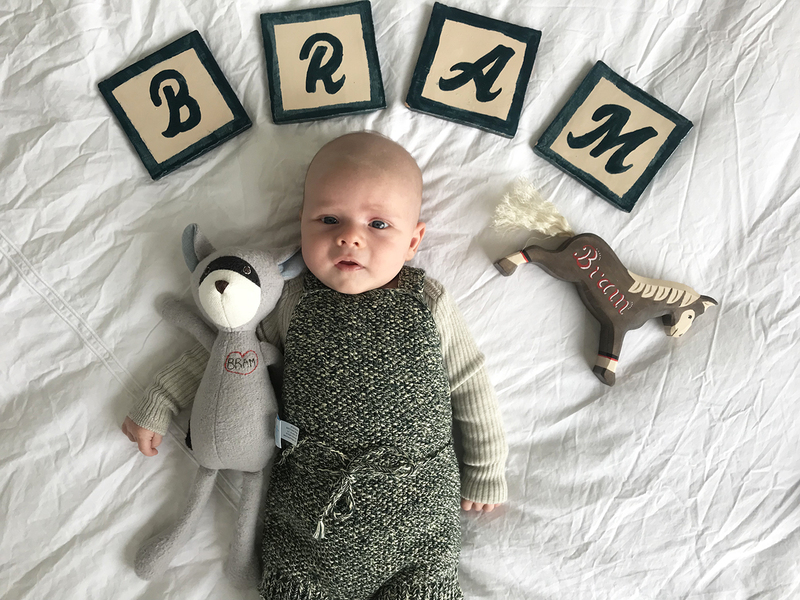 A few of my friends have given Bram gifts that were personalised with his name and I think it’s such a thoughtful and fun idea! I know all of the gifts that were given to Bram are chosen with care and consideration, and I love them all. But these personalised gifts are very special to me just because I know my friends put in a bit of extra effort to make them, or have them made. The name tiles were a present from my friend Sylvana. A friend of hers, Marianne Smink, hand-painted them for Bram. Sylvana told me that Marianne first had a look on my Instagram to see what our house looks like and what sort of style we like, and that she painted the tiles accordingly. And I love them! Perfect style and my favourite colour! The soft toy was a gift from Emilie and it’s so stinkin’ cute. It has the name Bram embroidered in a heart on its chest. It comes with a bit of a story. Last year, Emilie and I were in New York together for the ShopUp. We spent 24/7 together these days and caught up on all and everything. Of course my unexpected pregnancy was something we discussed in detail! One of the things we also spoke about was a potential baby name. I told Emilie that I didn’t have a girl’s name yet, but in case it was a boy, I really liked the name Bram. 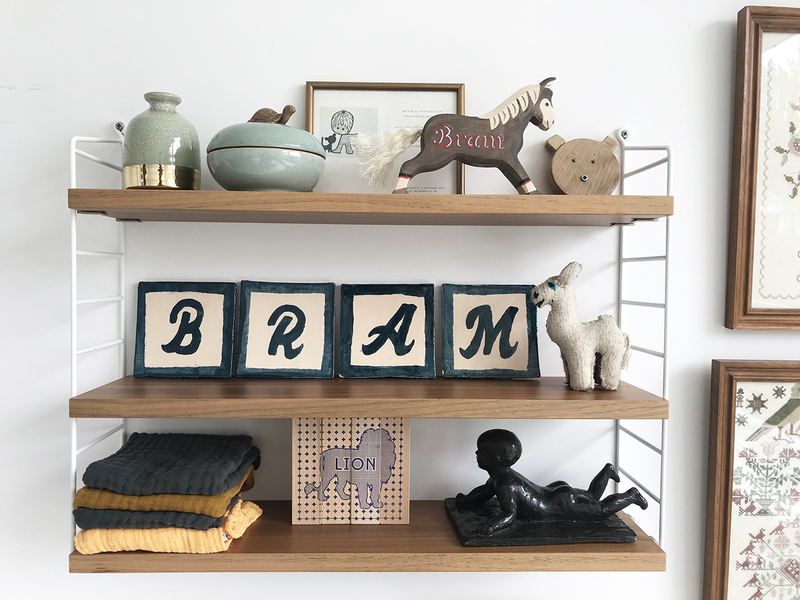 Then, one evening, we were in the adorable shop of Hazel Village where we had pre-ShopUp drinks and nibbles, and in a basket in the corner were a lot of Hazel Village soft toys piled up, all carefully personalised with a child’s name. The one on top, you guessed it, had the name BRAM embroidered on it. I felt it was a sign! This baby was going to be a boy, and his name would be Bram. A few weeks before Bram’s birth, I received a package from Brooklyn. A gift from Emilie! Inside was a soft toy from Hazel Village with a heart and the name Bram embroidered on its chest. So special! And lastly, the wooden horse was a present from my super creative friend Julie of Famille Summerbelle. She painted Bram on one side of the horse and 2018 on the other one. It is so pretty! I love seeing it on the shelves in our bedroom. Cute presents (if I may say so myself) and the cutest baby ever!